Hard to imagine why I needed a new yoga mat. The place where my feet go in downward dog? It's been shredded from various core poses my yoga teacher apparently concocts in her torture chamber basement. I was in the market for a replacement. I saw it in Yoga Journal magazine. It was mat-love at first sight; we seemed to be soul mates. It whispered to me...I will take you to the next level. We belong together. You are ready for all that I can bring you. Let me count the reasons I wanted this mat. It's all natural. 100% cotton. Nothing artificial or toxic, which is important when you've got your face on the mat while breathing deeply into your kidneys. It's traditional. Cotton is what yogis through the ages have practiced and meditated on. Could I be more yogi-like in my practice? It's eco-friendly and sustainable. 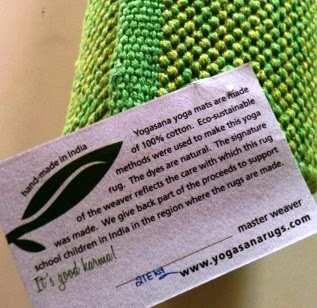 The mats are woven by craftsmen in India, who are able to support their families by their weaving skills. It's machine washable and highly durable. Guaranteed for 15 years, which is about 5 times longer than the mat I wanted to retire. It's beautiful. The colors are vibrant and luscious. I had a tough time choosing among Earth (brown), Air (gray), Fire (orange), Water (turquoise), Saffron (yellow), Ether (purple) and Spring (green). I decided on green, and within days my mat ($119*) arrived. It smells wonderful. I mean WONDERFUL. Like fresh, clean linen. I like the energy of it. It's a subtle thing, but I feel calm while on this mat. I was excited to take my practice to the next level, to see if I have what it takes to practice in a more traditional way, without the gripping assistance provided by rubber mats. And yet...it took me several weeks to get used to a couple of effects of the mat. Or not. Knobbiness: the parts of my body that bear weight -- palms and the tops/sides of my feet-- could not get bear the rough texture of the mat. I'm told multiple washings may resolve this. Slippy-ness: Not quite slippery, but definitely slippy. 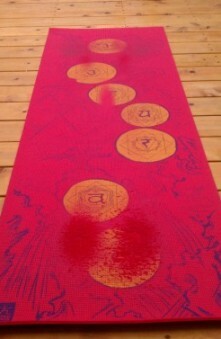 My adho mukha svanasana (downward dog pose) suffers greatly on this new mat. I simply don't have the core strength to isometrically pull my hands and feet together and remain stable in the pose. Spritzing the mat with water has helped others with this problem, but it was not enough to help me. I gave the mat a 4 week trial, and then asked my teacher (the one with the torture chamber basement) to test it, as well. She didn't experience the slippy problem (she's got core, I tell ya!) but the knobbiness bothered her, too. Bottom line? I now have a beautiful runner carpet. And a rediscovered humility about my yoga practice. And I'm back in the market for a new yoga mat. * I purchased the mat at wholesale price in order to review it honestly. Would this type of mat appeal to you? Why or why not? Darn, it does seem like a great mat...on paper, or in your kitchen.